Here is a brief list of mathematicians, natural philosophers, technologists and scientists (scientist is a term only used from the 19th century on) who also deserve the title philosophers. This list is based on the list of 154 names published in Irish Innovators in Science and Technology (2002) and the philosophers listed in The Dictionary of Irish Philosophers (2004) so is necessarily incomplete. 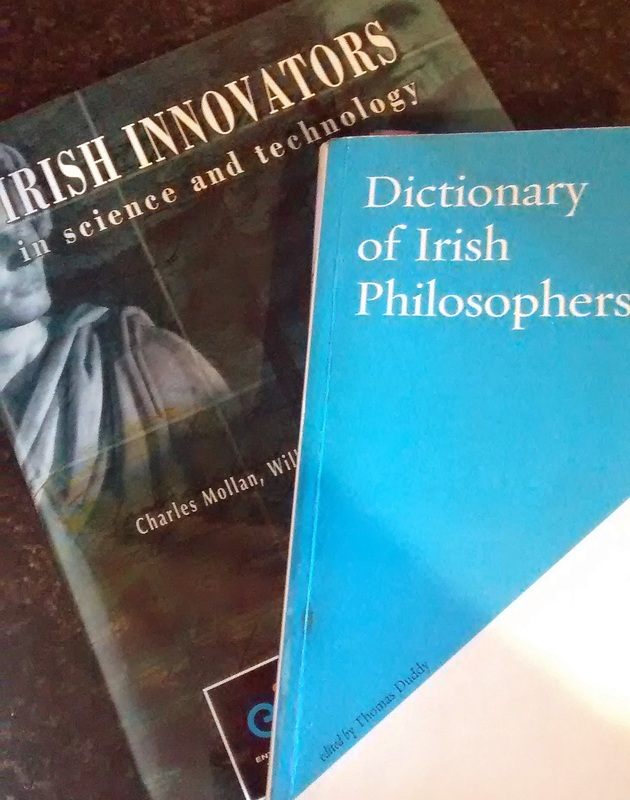 The first two names in particular may be a surprise, but it’s not unreasonable that Irish Innovators should include them, given that science’s roots are in natural philosophy. Augustin Hiberniae (Irish Augustine) – Seventh century – explains biblical miracles as extensions of the laws of nature rather than breaching of laws of nature. He used examples based on observations of nature. Robert Boyle – 1627-1691 – called the ‘Father of Modern Chemistry’, discoverer of Boyles Law, founder member of the Royal Society, developed the framework of the scientific method, also wrote extensively on moralistic, theological and utopian themes. William Petty – 1623-1687 – a founder member of the Royal Society and President of the Dublin Philosophical Society in 1687, his greatest technical enterprise was the Down Survey (digitised by TCD). He published in Philosophical Transactions on the design of a double-keeled boat and on “political arithmetick”. He was an early exponent of political economy (the first, according to Karl Marx), writing a number of treatises on taxation, national income and related topics, including The Political Anatomy of Ireland and Political Arithmetick. William Molyneaux – 1656-1698 – fellow of the Royal Society, founder of the Dublin Philosophical Society which helped create an Irish scientific tradition, writer of “Dioptrica Nova” (1692) on optics, translator of Descartes’ Meditations, advocate and friend of Locke to whom he sent Molyneaux’s Problem, and writer on philosophical subjects. His brother William Molyneaux was also an member of the Royal Society and wrote on optics. Both brothers’ work on vision was cited by Berkeley. George Berkeley – 1685-1753 – One of Ireland’s greatest philosophers, Berkeley also did important work on optics. His account of how we see distance became orothodoxy to the mid 19th century. He also wrote on mathematics, most importantly in a critique of Newton’s Calculus and on economics. Philosophically he was an empiricist and an immaterialist. Richard Kirwan – 1733-1812 – originally destined for the priesthood, he left the novitiate on the death of his older brother. A founder member and President of the Royal Irish Academy and a fellow of the Royal Society, he was a chemist, a mineralogist (his Elements of Mineralogy was the first systematic book on the topic in English), a geologist and a meteorologist. An Essay on Phlogiston and the Constitution of Acids (1787) is probably his best known work. Between 1800 and 1810 Kirwan submitted essays of a philosophical nature to the Transactions of the Royal Irish Society, including extensive criticisms of Hume. Some of these were later collected in Logick(1807) and Metaphysical Essays (1809). Dionysius Lardner – 1793-1859 – A member of the Royal Irish Academy and a fellow of the Royal Society, Lardner’s textbook on analytic geometry was recommended to a young William Rowan Hamilton. In 1828 he became the first Professor of Natural Philosophy in the University of London, where he was a brilliant public lecturer. After five years he left to create his Cabinet Cyclopedia (1830-1849), which he encouraged other scientists to contribute to. Besides this he left over a hundred publications. He is best remembered as a populariser of mathematics and science. He also wrote A series of Lectures on Locke’s Essay (1824). William Rowan Hamilton – 1805-1865 – Famous as a mathematician, most especially for his discovery of quaterions, Hamilton also did research on optics and dynamics. He was inspired by the idealism of Kant, searching for abstract mathematical laws rather than physical theories. For him, mathematics was aimed at discovering the internal laws of the mind, which would be found to correspond to the laws of nature. George Boole – 1815-1864 – The first Professor of Mathematics in Queen’s College (now University College) Cork, Boole is famed for his mathematical work, especially his development of mathematical logic which formed the basis of Boolean algebra. His work also influenced set theory, binary numbers and probability. Like Hamilton (who Boole apparently never met) Boole was very aware of the philosophical implications of his work. In his Investigation of the Laws of Thought (1854) he applies his mathematical logic to philosophical problems. A sequel, The Philosophy of Logic remained unfinished at his death. George Stokes – 1819-1903 – A mathematical physicist, Stokes is best remembered for his work on hydrodynamics, particularly fluid viscosity. He also investigated various problems relating to light and optics. Unlike Hamilton, his work tended to originate in engineering and physical problems with mathemtics as a tool. He contributed to the post-Darwinian debate, including the apparent conflict between the claims of science and the claims of religious belief in Natural Theoloy (1891, 1893). John Tyndall – 1820-1893 – Tyndall made his reputation (like Lardner before him) as a populariser of, and advocate for, science. Unlike Lardner he also made important scientific discoveries in atmospheric physics, also contributing to the research in diamagnetism, glacier motion and germ theory. Philosophically, his best known contribution was in his support of Darwinism, most famously in the Belfast Address of 1874, which set science within a history of philosophical and scientific thought. JD Bernal – 1901-1971 – An eminent scientist in x-ray crystallography, and a professor in various roles in Birkbeck from 1937 until his death, Bernal also did work in history, philosophy and sociology of science. A philosophical Marxist, he saw science as a social activity, tied into the spectrum of other social activities including philosophical, cultural, political and economic. In the movement toward socially responsible science his book, The Social Function of Science(1939), became a classic. For him, science was a starting point for philosophy, and both were bound tightly together with each other and with politics. There are others that might be included in this list, most notably John Stuart Bell (1928 – 1990), who is celebrated both as a quantum physicist and a philosopher of science. Peter of Ireland would also seem worth mentioning. Though not scientists, scholars like Kingsmill Abbott were involved in theoretical debate in areas such as perception. In addition, if William Petty is to be included, it would seem reasonable to include other figures in the history of economics such as Francis Hutcheson or Francis Ysidro Edgeworth. Another Edgeworth (Francis’ grandfather) who appears in the Irish Innovators is Richard Lovell Edgeworth (1744-1817) father of Maria Edgeworth. We need to celebrate our engineers, scientists and inventors. We also need to celebrate our scholars in other fields. We need to recognise, as AE advocated almost a century ago, the breadth of the contribution Ireland has given in all fields, not just the literary. Perhaps the philosophers, overlapping science and poetry as they do, might provide an entry point. Competing uni-dimensional versions of the “Irish Mind” reflect the ideological differences in the politico-cultural factions competing for ownership and control of the brand. A multi-dimensional version could not be contained within such narrow ideological confines and so it must always be censored and mutilated to fit. Ending that mutilation is a key step to ending the anti-intellectualism and poverty of ideas that dominates all debate in this deformed Republic.